Messages From Hughes Camp: Slavery Was Not the Cause of the War Between the States, The Irrefutable Argument. 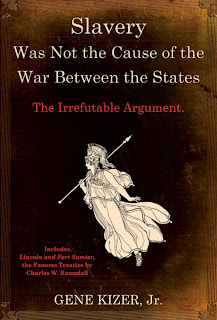 - by Gene Kizer, Jr.
Slavery Was Not the Cause of the War Between the States, The Irrefutable Argument. - by Gene Kizer, Jr. I am proud to announce a powerful new 250-page softcover book with citation, using over 140 sources that are listed in a bibliography. There are 56 sample pages on www.BonnieBluePublishing.com and a PDF file of sample pages that can be saved and emailed. Now you will know why Abraham Lincoln insisted that the war was about preserving the Union. He had to preserve the Union or the Northern economy would be annihilated because its success was based on manufacturing and shipping for the South. Without the South, the North was dead, bankrupt, millions unemployed, etc., and that's why Mr. Lincoln started his war. I also prove, beyond the shadow of a doubt, that the North did not go to war to end slavery or free the slaves. For example, if the North had gone to war to free the slaves, it would have started by passing a constitutional amendment abolishing slavery since there were more slave states in the Union (8) than in the Confederacy (7) when the war started. The Northern Congress did the opposite. It overwhelmingly passed the Corwin Amendment leaving black people in slavery forever, even beyond the reach of Congress. This alone proves, unequivocally, that the North did not go to war to end slavery or free the slaves.